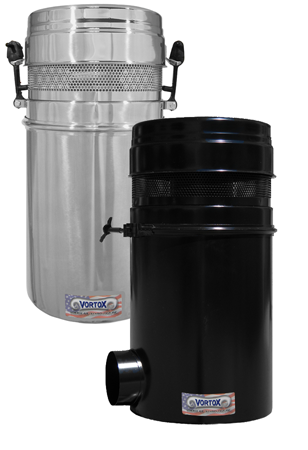 Vortox Air Technology side outlet air cleaners are designed to provide a direct, horizontal connection to blowers mounted between truck frame rails. A side outlet near the bottom of the air cleaner maximizes ground clearance of the air cleaner and keeps alignment with the inlet of most blowers. Truck Blower Air Cleaners are available in pressure or pressure/vacuum models. Pressure/vacuum models come with a 4" NPT aluminum camlock fitting installed. The camlock fitting can be accessed by unfastening the side rubber hooks to remove the cap and screen. All Truck Blower Air Cleaners are available in either polished T304 Stainless Steel or powder coated Electro Galvanized Carbon Steel. Two (2) mounting brackets in matching finish come standard with each air cleaner. Additionally, a washable internal foam precleaner, which reduces blower noise, comes standard with each Vortox Air Technology Truck Blower Air Cleaner. Filter removal is achieved in three easy steps: removing the band clamp, lifting the top off, and removing the filter element. We take great pride in our quality, craftsmanship, and finish, which can be seen in every air clean we manufacture. One look at a Vortox Air Technology air cleaner will make you forget about the others.